The legends are many… and all have their reasons to celebrate the Festival, in myriad ways. From the Ghats of Hoogly, to the Maths at Kanchi…a billion bow in reverence to the Mother. It's the festival of the nine nights…the Navaratri. A legend says that the Mother fought the dark forces for nine nights to give mankind goodness and godliness on the tenth morn and for eternity. Elsewhere, a Prince from Ayodhya battled a demon for 10 days to slay him, achieved an Incarnaztion's purpose and gave mankind a reason to celebrate…Dussera. People, nation over, sing the praise of Rama, enact the story of His life, burn effigies of evil, and dance for the good upon the earth. Here, Dussera marks the commencement of a glorious sacrifice, the VEDA PURUSHA SAPTAAHA GNANA YAGNA. 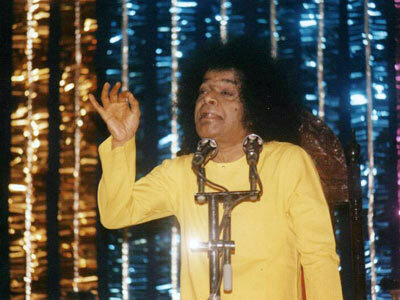 Vedic chants reverberate and charge the air during this weeklong propitiation of the Vedic Persona-God, presided by the Persona Himself- Bhagwan Sri Satya Sai Baba! 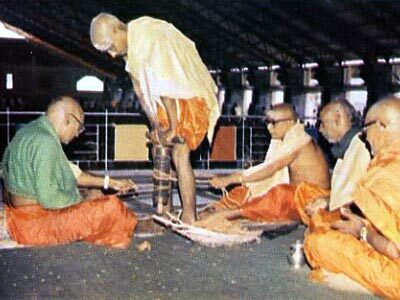 On the 6th October 1961, the first Veda Purusha Saptaha Gnana Yagna was conducted at Prasanthi Nilayam with the sole purpose of bringing about the welfare of all humanity. Since then the festival of Dussera has regularly witnessed this celebrated event. They come resplendent, both their silken ochre garb and in their knowledge of the Vedic Lore. 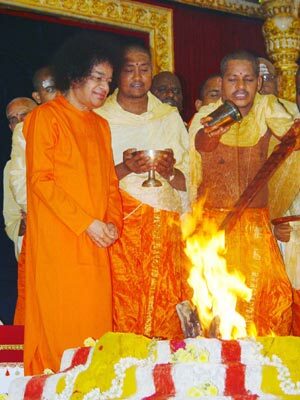 These venerated priests consider the participation in this Yagna a boon from God! The Chief Priest, called the Brahma of the Yagna, leads them on the first day of the Yagna, chanting mantras in the procession, to the Poornachandra Hall. 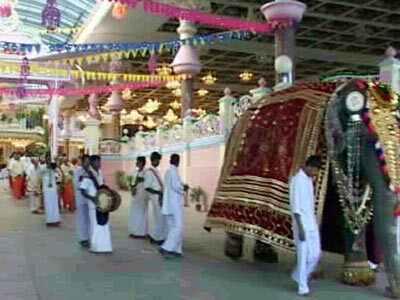 Trumpets and drums herald the start of the procession for the Yagna, from the Mandir to the Auditorium. A richly caparisoned Sai Geeta leads the procession, followed by various musicians and priest chanting hymns. Of course, the students from Sai Institutions join the priests in the Chanting. Meanwhile, the throng of thousands is already in raptures, for, the Lord has come on the stage, to Bless them with His Darshan. 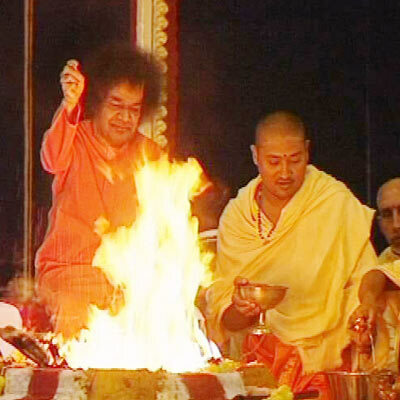 The Yagna proper begins with the ceremonial lighting of the Sacred Fire, amidst the chanting of the Vedas. In keeping with tradition, two priests rotate one piece of wood to and fro against a stationary block of wood, while a third one exerts necessary pressure to generate the heat required to igniting the friction area. The small spark is nursed with expert care, and very soon the sacrificial pit is transformed into a merrily blazing fire. 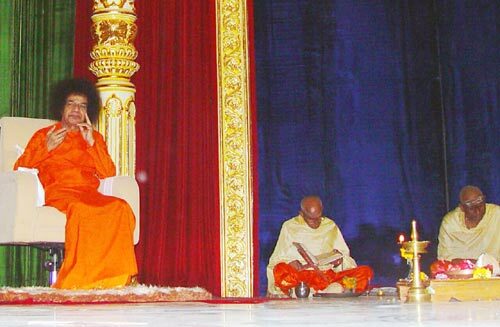 Swami, seated on a chair atop the stage, watches all this with the air of an uninvolved spectator, the Witness, the Purusha! Around the altar, sit three or four priests, reciting Vedic Hymns as they pour libations of clarified butter, into the flames. This is the Rudra Homam, an invocation to Lord Shiva, the Destroyer of Evil. 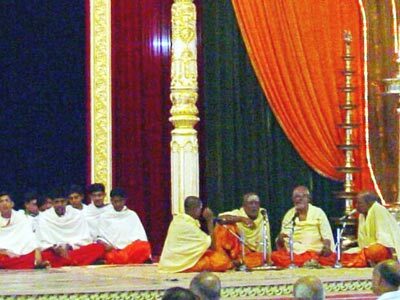 The central altar is flanked on one side by a group of students chanting Vedam, and on the other side, by a group of distinguished experts who have attained mastery over the Veda. They recite the Yajur Veda, a treatise on Yagnas and ceremonial acts. Both these groups simultaneously chant the Hymns so loud and clear that the atmosphere of Prasanthi Nilayam resounds to their vibrations. A priest with an athletic build performs Suryanamaskar or worship of the Sun as a visible symbol of the Supreme, to the left of the sacrificial pit. He circumambulates around the offerings chanting Hymns and then prostrates, more than a hundred times a day. 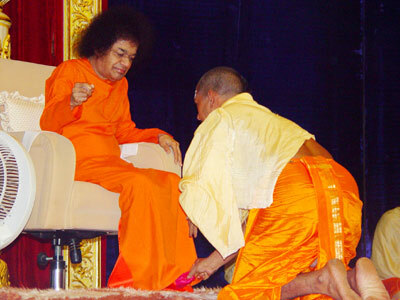 But when Swami is present, the priest never misses the chance of going around Him, the source of all Energy, and prostrates at the Lotus Feet. 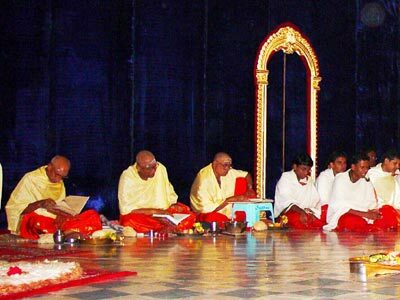 Meanwhile the other priests recite sacred epics like the Ramayana, Mahabharata, Bhagavatam and even the Devi Bhagavatam, during the period of the entire Yagna. Yet another priest worships the Sri Chakra, a mystic drawing representing the Supreme Mother. On the extreme right of the stage is performed the worship of the Mother Goddess. That place is also reserved for performing the daily Arati after all the ceremonies are over for each day at noon. Everyday in the evening, the Sai Kulwanth hall is filled to capacity. 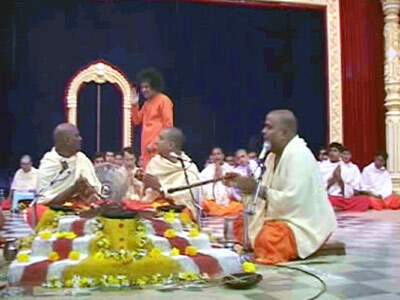 There is the Prasanthi Vidwan Mahasabha where Swami blesses some selected students and Elders to address the gathering on various spiritual topics. Above all, He himself speaks everyday elucidating the most sublime of spiritual topics in the simplest possible way! The eighth day is the Ayudha puja when all the instruments of work are worshipped. Swami comes to the garage in the Kulwanth hall where the drivers are waiting, their cars decorated with beautiful garlands. Swami gives each one of them a chance to drive Him in their respective vehicles. But the moment to watch out for is when he ascends the golden chariot. A sight for the Gods! The Final day of the Yagna is on Vijaydashami, the Tenth day, wherein the Poornahuti or the Valedictory offering is made. The day begins with an extraordinary manifestation of spiritual fervor among the pundits and the participants of the Yagna. Everyone in the Poornachandra Hall is expectantly waiting to see Baba accept the final offering of the Yagna. When the prescribed numbers of offerings have been completed, the priests sit on either side of the sacrificial altar. 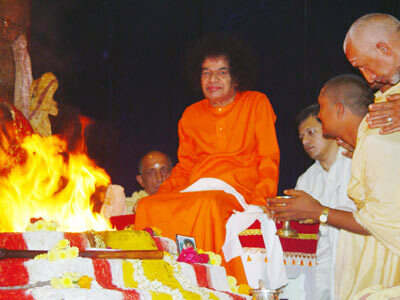 Swami ascends the stage amidst the chanting of the Vedic hymns and seats himself on a pedestal behind the sacrificial fire. 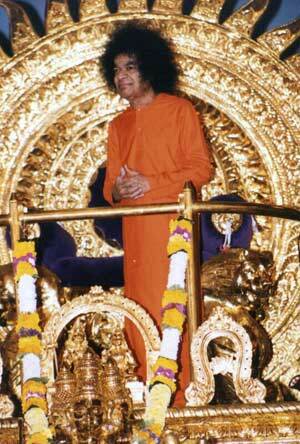 When the chanting reaches a crescendo, Swami with a sudden wave of His hand manifests a number of precious gems. As they shine in brilliance, he offers them, one by one, unto the sacrificial fire. 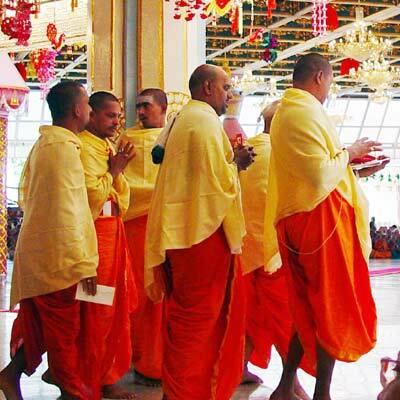 Everyone present in the vast hall is filled with awe on witnessing this most sacred and divine act, the Poornaahuthi! 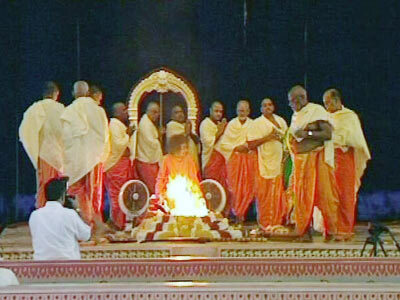 The priests then make their grand offering to the Veda Purusha. The priests circumambulate Swami and one by one, prostrate at His feet. Grateful indeed they are for having been selected to officiate in a Yagnam conducted by God himself! 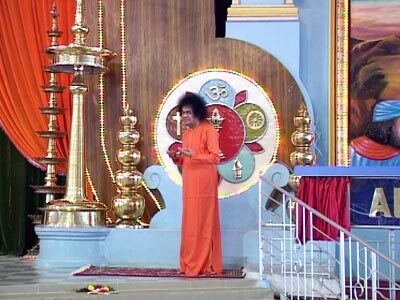 A few minutes later Swami comes down the stage, with a priest following him holding sacred water in a bowl. 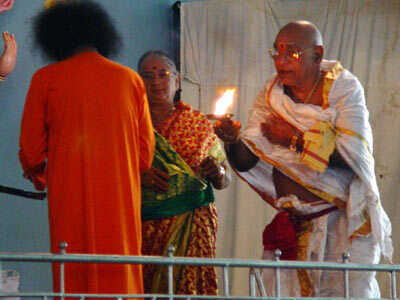 Swami, holding a big brush in his hand, dips it in the holy water and sprinkles it on the devotees. 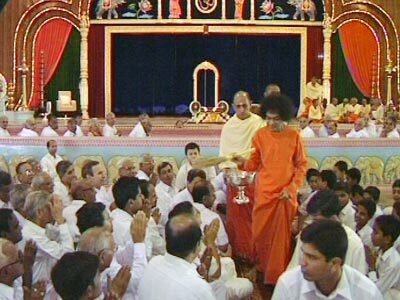 As Bhagawan goes around the place sprinkling holy water, the students and the staff, the young and the old, the men and the women, seated inside and outside the Poornachandra, in short, everyone is blessed by this holy shower of Divine grace! The crowd simply goes delirious on receiving this great blessing! 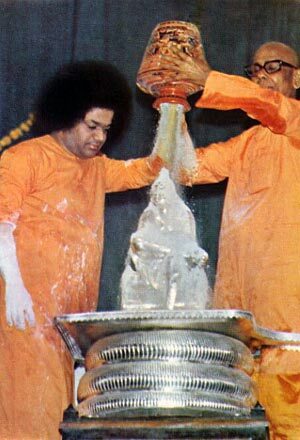 As a grand finale, in the yesteryears, on the Poornahuthi day, there was also the famous Vibhuthi Abhishekam where Swami churned an upturned empty vessel to bathe the statue of Shirdi Baba in a continuous shower of sacred ash… unbelievable, but true! "The heart of man itself is the sacrificial fire altar. The pangs of desires are the tongues of flame; the evil that is in man is the offering that goes into the fire and the treasure of unruffled Ananda is the ultimate gain. That is the real Yagna that you have to perform everyday in your life. ".